Beijing's mayor told state media the city has some regulations to combat smog but that the laws are poorly enforced. 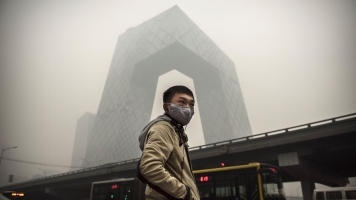 Beijing is creating a special police team to reduce the city's toxic smog. The smog has been so bad residents have had to stay indoors for days at a time. Beijing's mayor told state media the city has regulations for "open-air barbecues, garbage incineration, biomass burning [and] dust from roads" but that enforcement of the laws has been weak. However, the public has pushed officials to address larger sources of pollution, such as coal-fired power plants. State media says 500 polluting factories will be shut down this year, and Beijing's mayor promised to slash coal consumption by 30 percent. Air pollution isn't just Beijing's problem. Earlier this month, China issued a national fog red alert for the first time ever.